Record-breaking torrential rain has left at least 65 dead and 47 missing in western Japan, state broadcaster NHK reported on Sunday. Most of the victims were buried alive by mudslides or swept into rivers and canals. 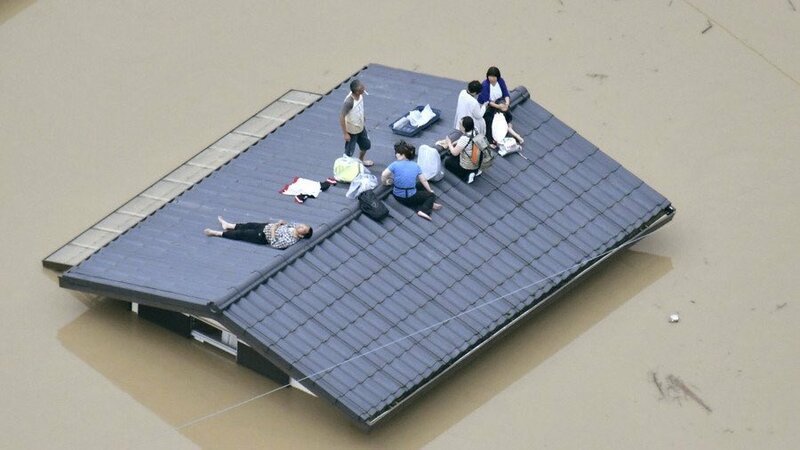 More than 1,000 residents are stranded on rooftops in Okayama Prefecture and await rescue. Nearly 65 lost and 2 million displaced – thoughts with all those battling & suffering disastrous floods in Japan. Rescuers in Japan dug through mud and rubble on Monday, racing to find survivors after torrential rains unleashed widespread floods and landslides that killed nearly 100, with dozens missing. Rain tapered off across the western region battered by last week’s downpour, revealing blue skies and scorching sun forecast to push temperatures above 30 degrees Celsius (86°F), fuelling fears of heatstroke in areas cut off from power or water. “We cannot take baths, the toilet doesn’t work and our food stockpile is running low,” said Yumeko Matsui, whose home in the city of Mihara has been without water since Saturday. About 12,700 customers had no electricity on Monday, power companies said. Tens of thousands had no water, Japanese media said. The death toll from the rains reached at least 94 after floodwaters forced several million people from their homes, NHK national television said, the highest toll since 98 people were killed in a typhoon in 2004. Another 58 were missing, NHK added. The automaker, which suspended operations at several plants because of the rains last week, said the halt would continue at two plants until Tuesday, as it cannot receive components, though both were undamaged. Refineries and oil terminals were not affected, but blocked roads limited access to one Showa Shell oil terminal in the city, causing gas and diesel shortages nearby. At one landslide in Hiroshima, shattered piles of lumber marked the sites of former homes, television images showed. Others had been tossed upside down. Water still swirled through most of the hard-hit city of Kurashiki, despite ebbing floods that opened the route to a hospital where nearly 100 patients and staff had been stranded on Sunday. Thousands flocked to evacuation centers in the city’s district of Mabi. “Nobody has anything to wear. We need shirts, trousers, underwear, socks and even shoes,” its mayor, Kaori Ito, told the Asahi Shimbun newspaper. Although evacuation orders were scaled back from the weekend, nearly 2 million people still face orders or advice to keep away from homes, fire and disaster officials said. An emergency management center has been set up at the prime minister’s office, with about 54,000 rescuers, drawn from the military, police and fire departments, fanning out across the west and southwest. Japan monitors weather conditions and issues warnings early, but its dense population means every bit of usable land is built on in the mostly mountainous nation, leaving it prone to disasters.